The new 2018 issue of the Perth Mint’s Marvel Series bullion coins, the 2018 1 oz Tuvalu Black Panther Marvel Series Silver PCGS MS 70 FS is available at Bullion Exchanges. The coin, the third in the series, features the Marvel Comics superhero Black Panther. Previous releases had Spiderman and Thor on the reverse side of the coin (back), with a profile of Queen Elizabeth II on the obverse (front). The iconic Marvel character, Black Panther, was created by writer Stan Lee and writer-artist Jack Kirby, first appearing in Fantastic Four in July 1966. This series presents the Black Partner as T’Challa, king, and protector of the fictional African nation of Wakanda. Black Partner is also known for his genius intellect, physical training, martial arts skill, and access to advanced technologies to combat his enemies. 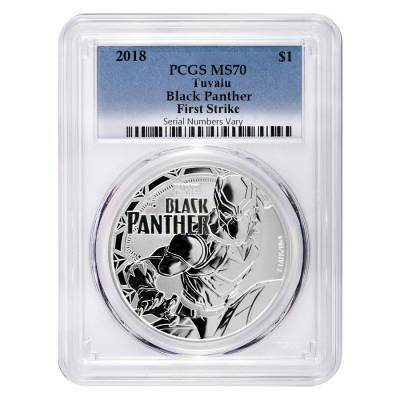 The reverse depicts a classic image of Black Panther, ready for combat. 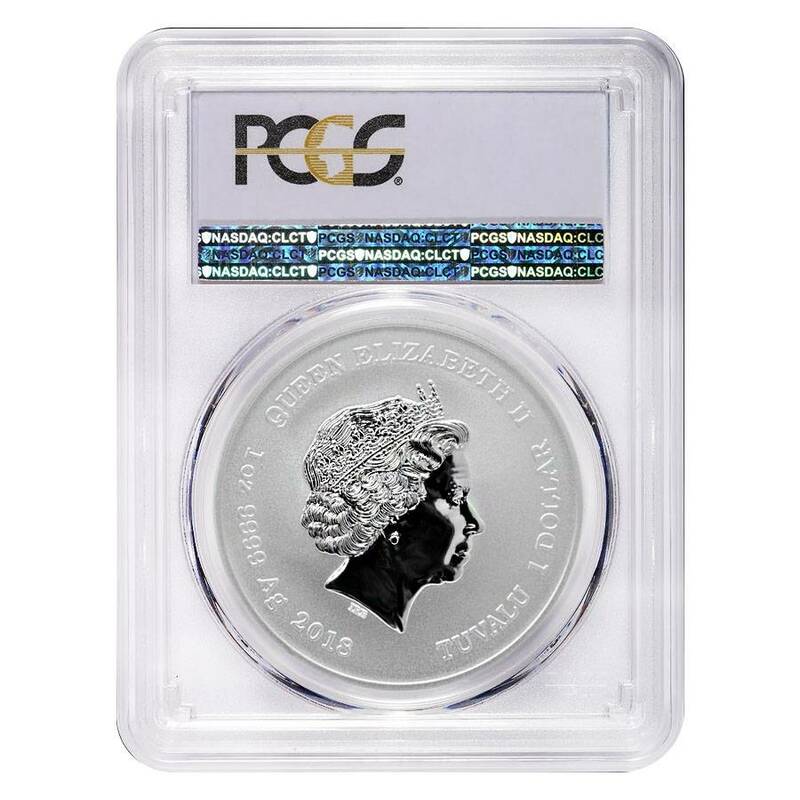 The obverse features Ian Rand Broadley effigy of Her Majesty Queen Elizabeth II. The coin is expected to be sold fast because of its purest .9999 silver content and a limited mintage of 50,000 pieces only. With a limited mintage, this spectacular silver piece bearing this legendary comic book character is an excellent gift for any Marvel fan. The coin was certified by PCGS within the first 30 days after the official release as MS 70 - fully struck coin, free of visual marks under 5x magnification. Made from .999 fine Silver, with a weight of 1 oz. Has $1 AUD face value. PCGS MS 70 FS - Fully struck coin, free of visual marks under 5x magnification. Coin comes packaged in PCGS holder with First Strike Label. With this purchase, you earn 73 Bullionaire Bucks 73 BB = $0.07. We currently have 33 of this item in stock. For every $1 spend, you will earn 1 Bullionaire Buck which is equivalent to $0.001 off a future purchase. 73 BB = $0.07.